The campus is well designed, a fusion of built and open spaces, creating a wholesome environment for the children to grow. Open spaces dominate the design, right from the huge grassy football field in front to the various landscaped spaces in between buildings, complementing the unspoilt unpolluted environment. 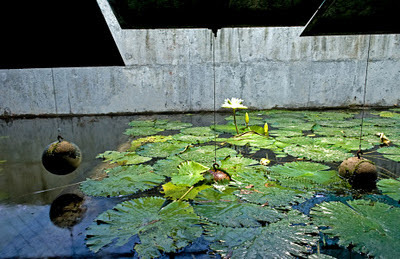 There is an emphasis on nature which runs throughout the design. The classes are organised as a group of roughly semicircular blocks, opening out onto the central open space with the amphitheatre as the focus. The buildings are contemporary in design, without being overbearing. Sloping concrete roofs, propped upon inclined cobalt blue steel columns, with exposed brick curved walls behind, creates a simple elegant language which goes well with the rural context. There are large glass windows which let in plenty of light into the class rooms. The structures are only double storeyed and ensures that the scale is comfortable for the children, with elements like the windows, the glazed broken tile bands at the slab levels etc – all further breaking down the scale to add to the anthropometric comfort. 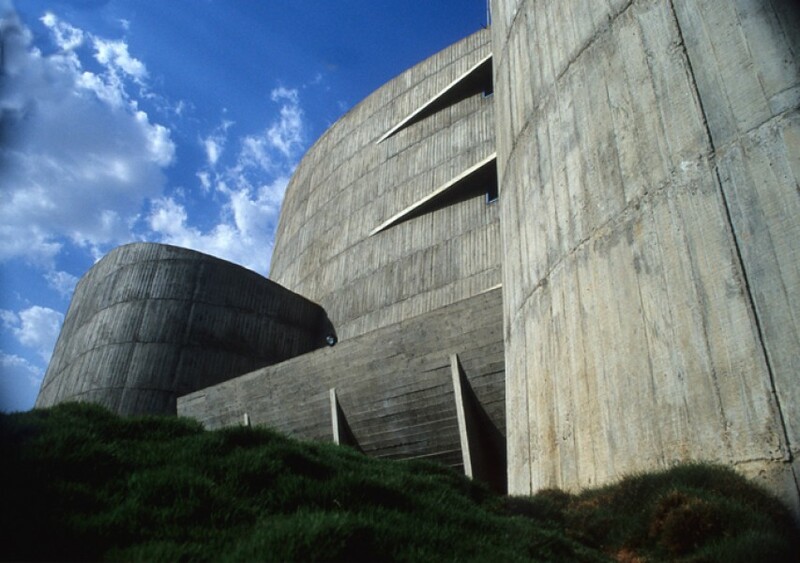 The sloping roofs and the inclined double columns create a sense of monumentality. The hostel buildings are massive four storeyed structures and are somewhat out of sync with the rest of the campus. Although the same language of exposed bricks is followed, the refinement of the design is somehow lacking. Accommodation for the teachers & their families are also provided inside the campus as double storeyed bungalows, in a linear pattern. There are intimate balconies with pergolas on top which creates an interesting composition. The school places a lot of emphasis on physical activity and development. In the evenings, the playgrounds and the roads are filled with kids playing football, basketball, volleyballs, skating etc, in addition to jogging around the entire campus. The campus during this time is buzzing with activities, a space of heightened energy in the middle of a sleepy rural ambience. Architecture and product design are closely related. Matharoo Associates deal with both. For this reason they have structural engineers in their team. The interest in product design shows up not only in there projects, where they often design the complete building from the external shell to the door handle but also in the design of vehicles such as motorcycles or the remarkable Mobile Van called ’la Cattiva’, which is to go out to people for blood donations. In architecture they cover a wide field. Different functions call for different buildings and equally different is their expression. What they all have in common is not just the use of concrete but the aim to cut costs and avoid waste. In their buildings most of the elements are locally produced and they tray to use construction materials more than once, e.g. by building the stage of the Prathama Blood Centre auditorium out of used form work. 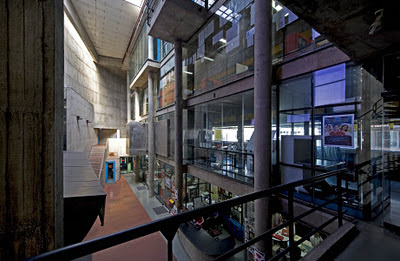 Some of their buildings seem to be inspired by Le Corbusier. 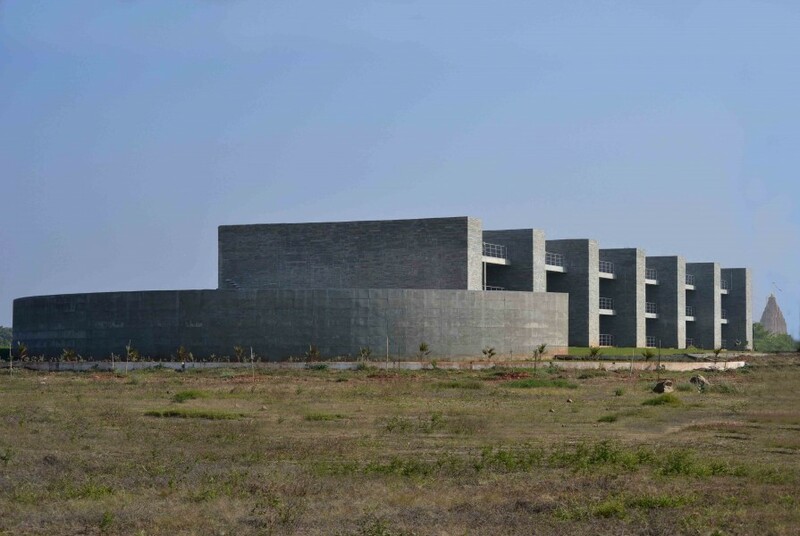 The Prathama Blood Centre looks like a sculpture out of folded paper despite the massive concrete walls. The tension between the heavy material and the light touch of the design is palpable also in the insight, for instance the free-floating staircase in front of the high massive concrete wall with the light streaming downwards. The Jain Guest house is a religious campus in Rajastan, originally founded as a shelter for stray cows. Its structure is very rigorous, the proportions are well chosen, geometrically strict. The ‘House with Balls’ is part observatory, part weekend retreat and a place for experiments in sustainability for an Indian Professor. All these functions are realised in one room, a design of stunning simplicity. The balls exist in reality and serve as counterweights for opening and closing the shutters. Our studio undertakes design work ranging from architecture, interiors, landscape and structures to products and automobiles. We see all design disciplines as one without boundaries and work with a fully integrated approach leading to wholesome result. The two pillars which are fundamental and non-negotiable to our practice are functionality of program and efficiency of services, while innovation and wit become essential ingredients of our soulful cuisines. There has been a symbiotic relationship between structure and architecture ever since the firm’s inception. We use materials in their natural form, where sunlight becomes the only embellishment as it varies and changes through the day and across the seasons. While our buildings remain truly embedded in nature, we approach them with extreme clarity and utmost restraint. WHY do you make architecture? Unlike other animals, human occupation in buildings destroys that part of our limited earth forever. Therefore we believe that this inherently destructive process be made as creative as possible. We see architecture as art that we dwell within, and without. There is an inner urge to make buildings which are meant to be discovered; unfolding around one’s body as one moves through, revealing their secrets and meanings; over time and over spatial layers. We look for peculiarities in the clients brief and context that could render our creations an unusual character and towards a direction less explored. We address this peculiarity strongly in the concept and then it is further enhanced through rigorous design development to make a functional working building that on one hand fully satisfies the clients’ needs, this being our minimum guarantee, and on the other gives us a unique creative solution to the problem stated. Set, determine: fix conclusively or authoritatively; "set the rules" (mathematics) an abstract collection of numbers or symbols; "the set of prime numbers is infinite"
From its humble inception as an initiative to feed, shelter and protect stray cows otherwise intended for slaughter, this expanse at Pavapuri in Rajasthan has grown into a large religious campus containing temples, prayer halls and residential facilities, visited by 500,000 people yearly - not to mention the herd of 6,000 to 12,000 cows that comprise its permanent residents. Traditionally having been constructed by Sompuras, temple craftsmen, buildings other than the main shrines remained in the shadows. The need for a new dharamshala – religious guest house, which would stay true to its spiritual roots whilst performing the seemingly contradictory function of providing pilgrims with creature comforts, created a rare opportunity. Originating in Bihar between the 9th and 6th century B.C almost at the same place and time as Buddhism, Jainism is a religion with approximately 4.2 million followers in India. Devout practitioners of this exacting religion are expected to denounce worldly life and bonds. Customs such as living in the wilderness devoid of all encumbrances - including clothes, abstaining from any physical contact whatsoever, fasting for more than 100 days, walking barefoot for distances exceeding 1000 miles and plucking each strand of hair of their head to remain bald are the norm. Extreme non violence, absolute renouncement, strict solitude, and severe austerity form its core beliefs. Profound concepts of space and time and the accurate definition of units such as 1 Avali - the time required to blink, have featured in Jain scriptures as far back as its inception, they are even credited with identifying the idea of the infinite. 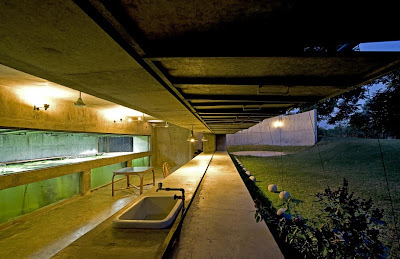 The design became an exercise in expressing these intangibles through the paradoxical creation of a void. A set of floating voids open to the rising and setting sun defined by stone blinkers became the only intervention. These seven stark service blocks, each of a 1:4:8 proportion and the 4:4:2 entrance mass come together volumetrically to form a perfect cube when reflected in the water of the adjacent lake, which is meant to be diverted up to the building line in the next phase of construction. Even the amphitheatre complies with this stringent geometry with a diameter of four times the basic 2.4m unit. The final effect was conceived to be like a chant, simple and repetitive, its power being in the resonance with the self inside and the extension of the self outside. A typical Jain temple consists of linearly arranged sequential spaces beginning at the ornate entrance , leading up to a Mantapa or hall and terminating in the sanctum or garbha griha which is topped by a tower known as the Shikhara, the entire complex is then flanked on either side by the shrines of the Tirthankaras, the founders of Jainism. 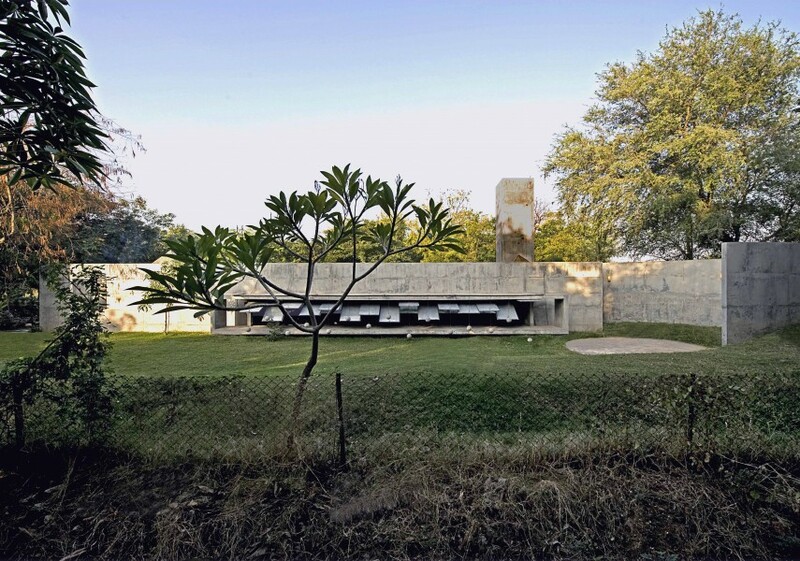 This arrangement is reinterpreted in the plan of the Dharamsala with the strong linear axis maintained and translated into a defining walkway which runs along the entire length of the building. A block is created to define the entrance at one end and the Mantapa transformed into an amphitheatre defines the other. The image of the Shikara is retained in the proposal for a bird tower and the shrines flipped along the central axis and stacked onto one side create the rooms and complete the complex. The 24 rooms reflecting the 24 Tirthankaras, are spread over a series of modules that are fully self sufficient, each having its own services and circulation. The modules are tied together by an elevated walkway bathed in light from above through the translucent roof that arcs over it. 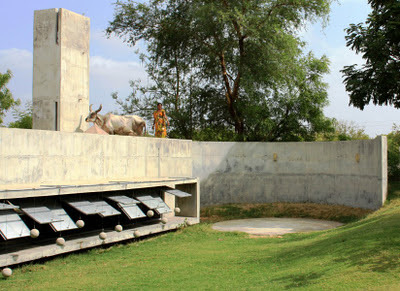 Evolving from an originally envisioned concrete roof, this accommodates the headroom required for the holy water held high on the shoulders of the passing Jain monks below. Locally available materials such as Nimbada stone layed in a masonry that is prevalent in the surrounding areas , polished Kota stone floors from quarries nearby and floor plates cast in everyday concrete make up the restrained material palette. In keeping with the essential tenants of Jainism, of non violence and solitude, a 100 mm wide separation is retained between all the elements of the composition rendering them pure. At the only instance where the stone blocks had to meet the ground they will eventually reflect in the lake and become suspended elements in the landscape. Is’nt this 2500 year old Jain philosophy of never infringing on the earth evocatively similar to those aspired to by the proponents of the ecological movement today? The plan is an outcome of a rational step-by-step intervention that resulted in the basic defining lines, and the Void. The exterior skin that presents an image of ‘the simple and one’, disintegrates into sub spaces as soon as the entrance ushers one into a four-storey ‘Void’. From this buffer, a person here becomes visually conscious of the activities carried out. The glass wall disappears showcasing the complete ‘Process’, highlights of which, like the Blast Freezer, Conference room and a Hangout balcony are further accentuated by protruding them out of the glass wall. Standing mute and staid, the service block, The ‘Support’ silently feeds the Process with the requisite demands The building stands manifested in its intrinsic nature within and an object rooted in nature without. The project has specifically dealt with restrictions of space and economy. The costs have been kept abysmally low by custom designing and locally fabricating all doors, windows, modular furniture including steel work stations, press metal storages, double glazed partitions even door handles. Moreover, the Architect’s Scope of work included certain product design items like the auditorium chairs and fully automatic donor chairs, compact 3 in 1 hot and cold-water dispensers, compact cold room blood stacking & identification system & moving ladders for cleaning glass, even 2 specially designed blood donation vans, large fixed furniture like conference, reception and pantry tables are all set insitu concrete as also the 5 m long entrance gates. The staircases are precast concrete units. The false ceiling and acoustic paneling in auditorium is in lightweight concrete with insulating vermiculite. All the wooden planks used for exposed form work was salvaged and was later used for the auditorium staging. 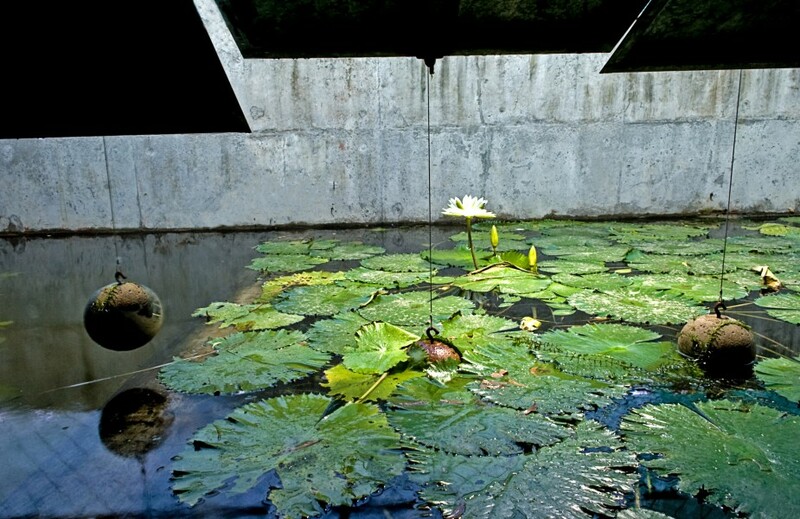 Rainwater is collected and directed into percolation tanks and the water body is a self-sustained ecosystem with Koi fishes and water lilies. The project was completed in 12 months and was built at a cost of under $200 per sqm., including civil, electrical, plumbing, air-conditioning, interiors and site development. Can architecture transverse the boundaries and become all incompassing ‘DESIGN’? Can architecture become a catalyst in motives that are social? Can architecture be a low cost pursuit without having to appear so? Can architecture transform mere facilities into public institutions? These are some of the issues the design attempts to address.